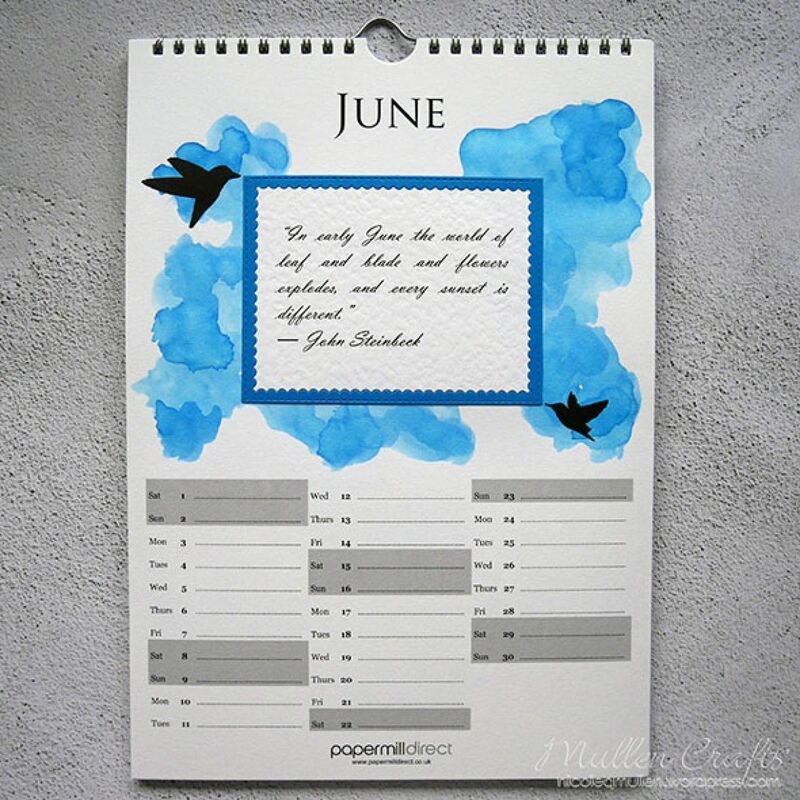 As you may have seen from my previous post the new Papermilldirect 2019 Create-a-Calendar's are out and I love working on them because of the creativity they allow you. 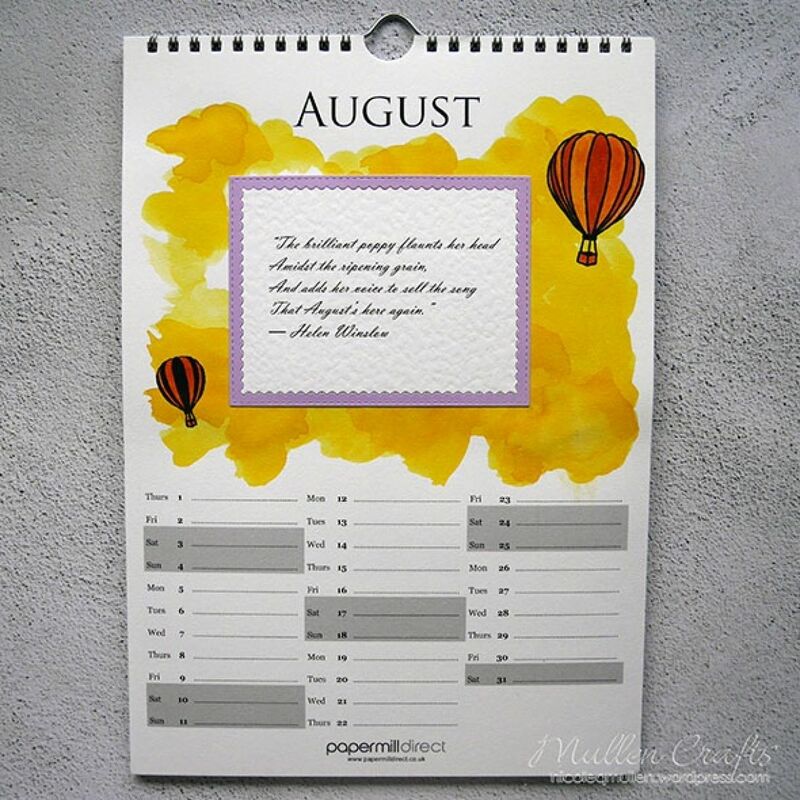 Last year I picked a different theme for each month that reflected the month, like Christmas in December, back to school in September, summer in August and so on. This year I decided on a literary theme. 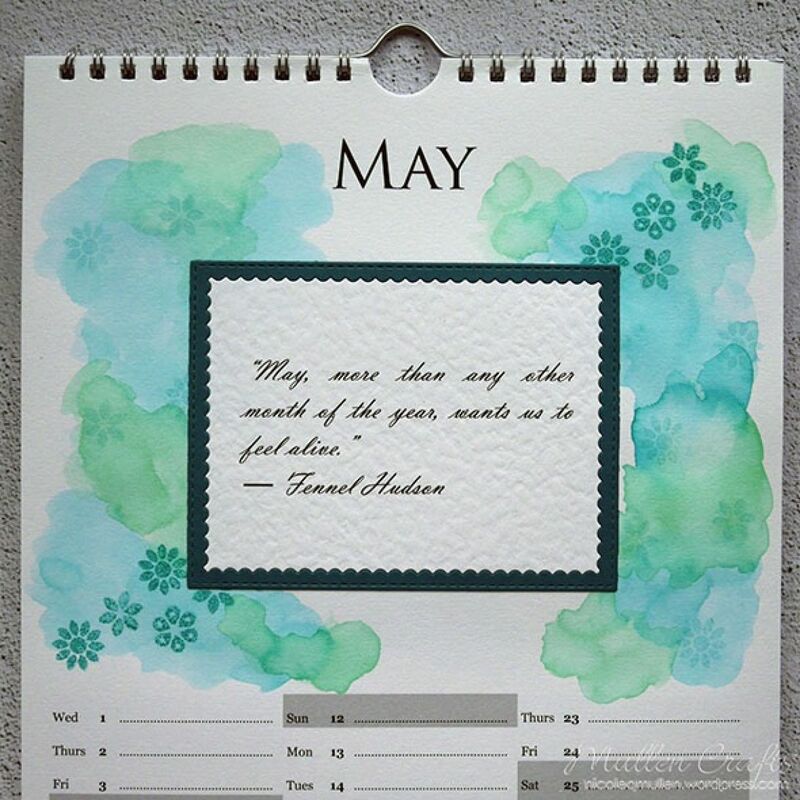 I found quotes that reflected each month and printed them on Papermilldirect Hammered White Card. I then die cut these out using a frame die. I cut the outer part of the frame in varying Papermilldirect card colours. In this post I will share the next 3 months with you! Following on from March in the last post is April. For this month I used Papermilldirect Lilac Smooth card for the frame and the Hammered white card for the inside printed sentiments (as on all of the pages). 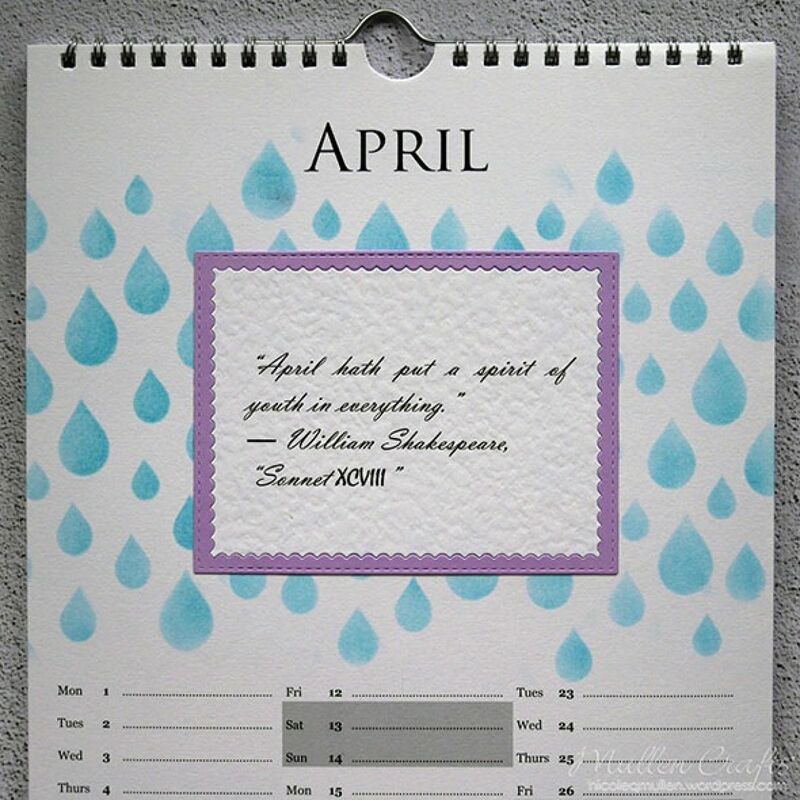 For April rain and showers is what comes to mind so a rain drop stencil was calling out to me to complement this one. 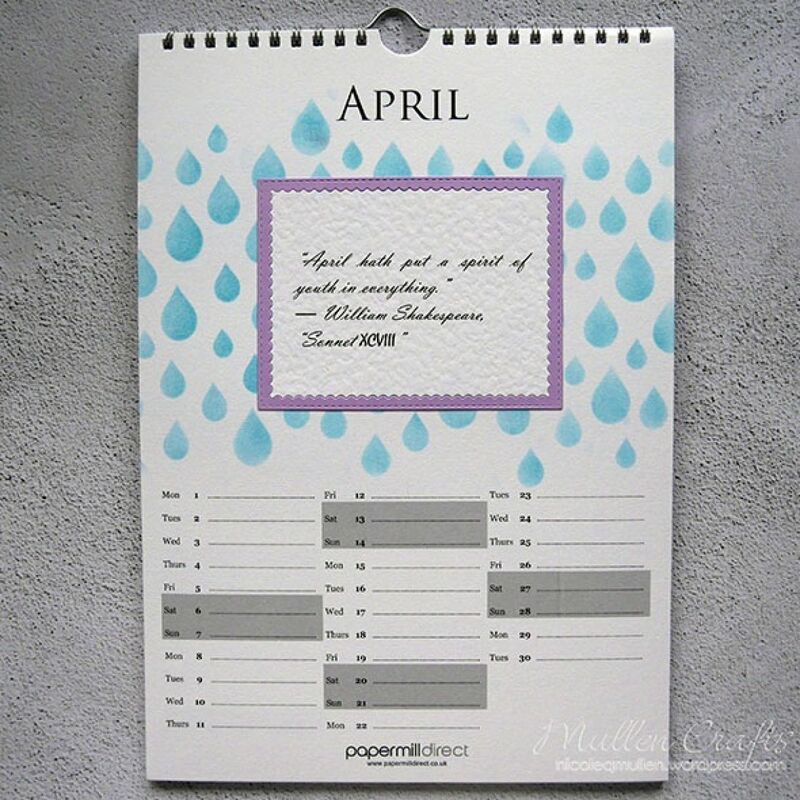 I used Tumbled Glass distress Ink to apply this and let the raindrops really stand out against the calendar page background. For the May page I used the Papermilldirect Dark Green plain card for the frame. I mixed this in with Peacock Feathers and Cracked Pistachio Distress Inks for a water coloured background. I stamped some flowers in the Cracked Pistachio ink in first generation and second generation stamping. 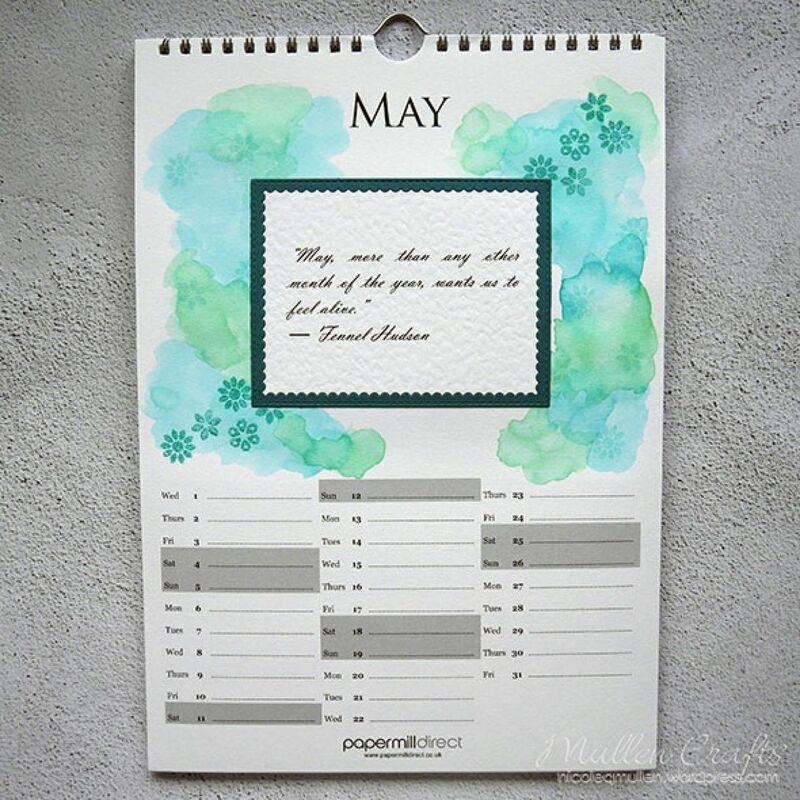 The calendar is such good quality it really takes the amount of water for this blending of colour technique so well with no buckling or warping, even though it is not watercolour paper! 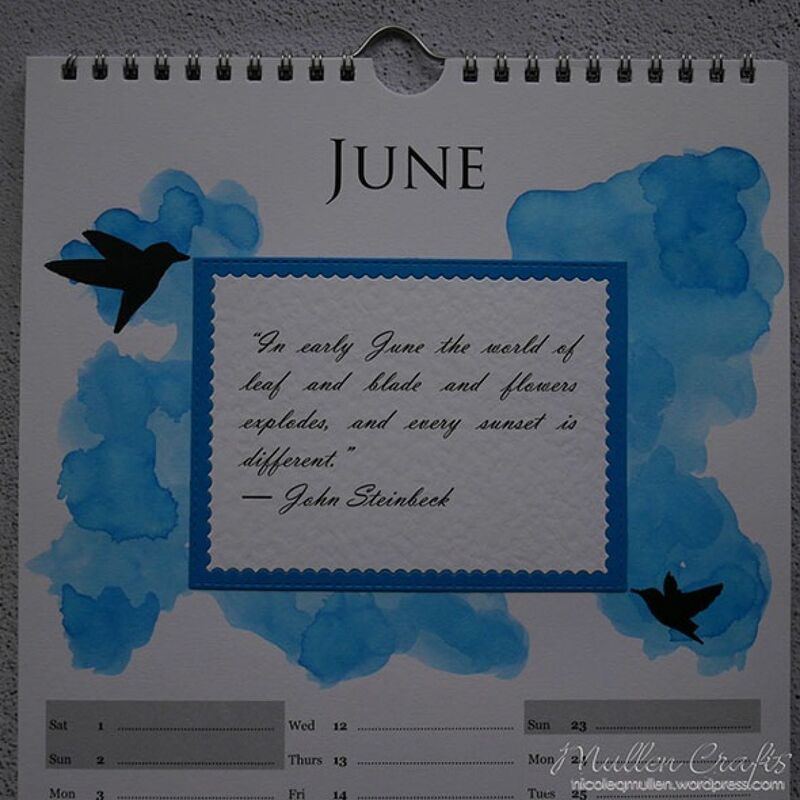 For June I cut the frame from Papermilldirect Deep Blue card. This contrasted so nicely against the white, I definitely want to combine this into a white on white with a pop of colour card in the future! The background on this one was created with Salty Ocean Distress Ink which coordinated with the Papermilldirect card perfectly! Some birds stamped on it were the perfect touch on this one. 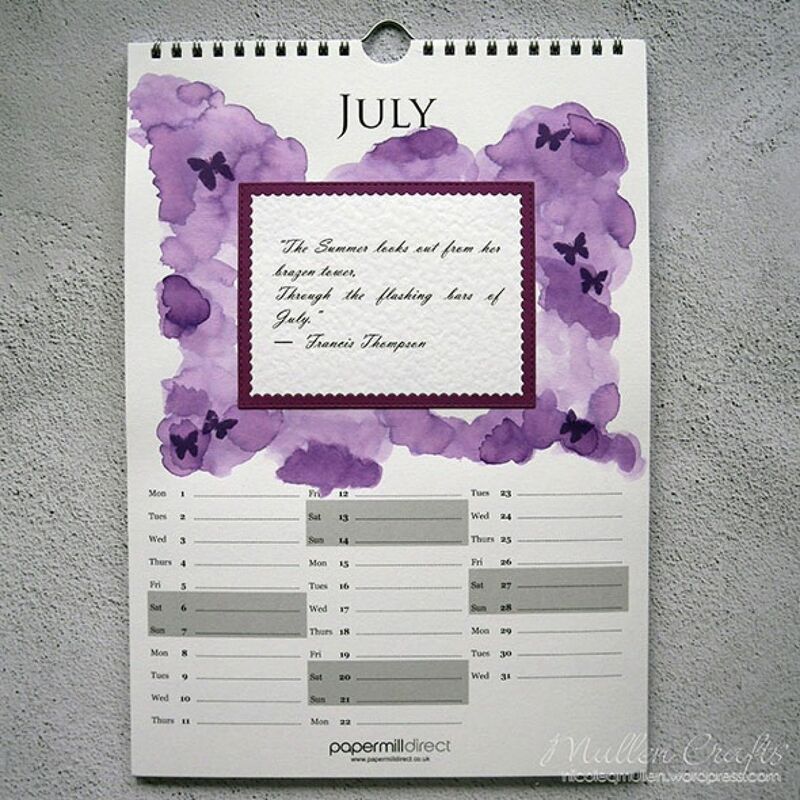 For July I used the fantastically vibrant Papermilldirect Purple Grape card. I matched this with a watercoloured Dusty Concord Distress Ink Background, to make a really vibrant and fun page. A few stamped butterflied in Dusty Concord ink finished it off nicely giving the page more movement. 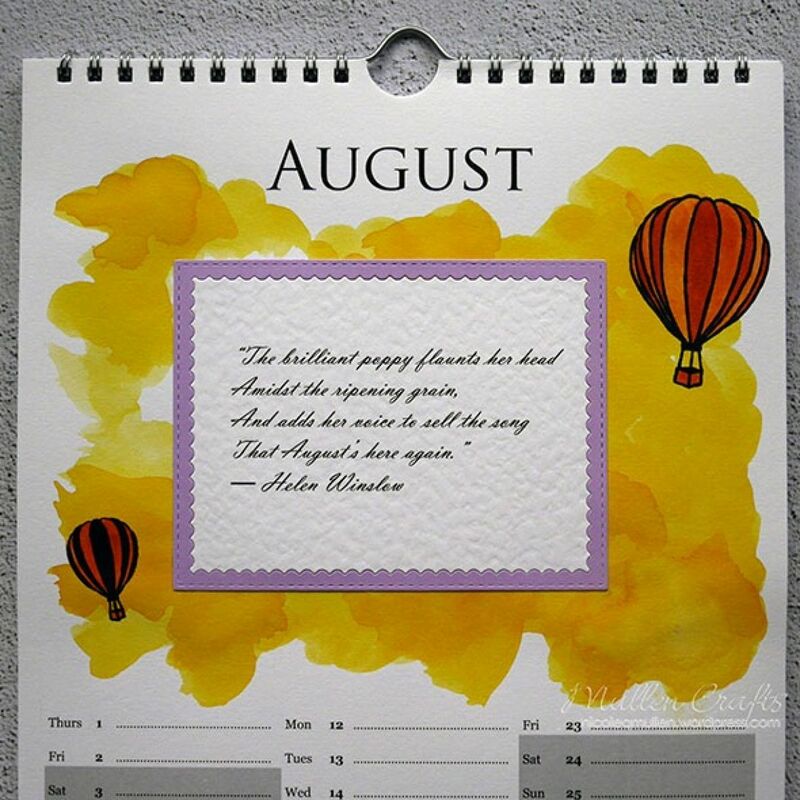 For August I selected the Papermilldirect Lilac card as I wanted a real contrast on this page. I combined this with Mustard Seed and Rusty Hinge Distress Inks. I stamped some hot air balloons on this page, and 'coloured' them with the less diluted Distress Inks. Stay tuned for my next post with a few more months and see how much more fun I had with this calendar. Make sure you get your hands on yours before they are all gone too!